The 100,000 genome project is a government funded initiative that aims to sequence the whole genome (all the DNA) of 100,000 individuals living in England who have a rare genetic disorder or one of a number of common cancers. Patients with a confirmed clinical diagnosis of Alport’s syndrome, in whom a genetic cause has not been found (i.e. their DNA has been screened for mutations in the Alport’s genes with no alteration identified) are eligible for recruitment to this study. Currently recruitment is available through one of five pilot sites in Cambridge, Guy’s Hospital, Manchester, Newcastle and University College London. For more information please info@alportuk.org. I studied bioch emistry at the University of Bristol and have recently been awarded a PhD in medicine from the University of Manchester. 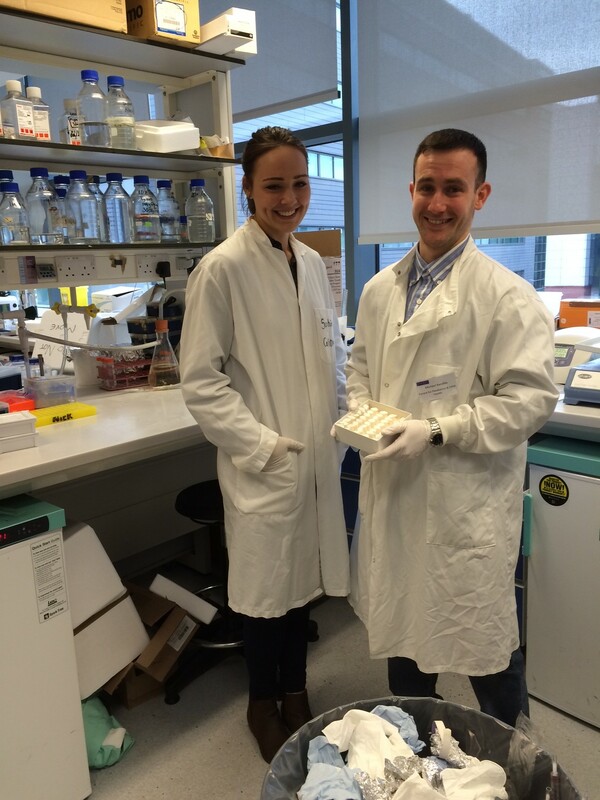 I am now employed as a scientist at the university of Manchester where I investigate the kidney in Alport syndrome. this year allows me to study them in more detail. Every human has a unique genetic sequence which contains the information required to produce the proteins that make up the human body. Variations in this genetic sequence can prevent the body from producing a protein called type IV collagen and this causes Alport syndrome. What is type IV collagen and why is it important? Type IV collagen is an extracellular matrix protein. In much the same way as a spider creates a web on which to live, cells produce extracellular matrix and attach onto it. Cells and extracellular matrix proteins together make up the tissues of the human body. In the kidney tiny filters operate to remove waste products from the circulation. The extracellular matrix part of these kidney filters contains type IV collagen. How can we better understand and treat Alport syndrome? The impact of loss of type IV collagen on the extracellular matrix within kidney filters is not fully understood. Using highly sensitive analytical techniques, such as mass spectrometry, we can find out how the extracellular matrix part of kidney filters is changed during Alport syndrome and therefore identify new therapeutic targets. My project concentrates on new ways to visualise the kidney filtration barrier in Alport syndrome. I am using a new imaging technique to create 3D models of the filtration barrier and podocytes. Podocytes are cells that attach to the filtration barrier with special foot processes, similar to the tentacles of an octopus. We know that under normal circumstances it is the podocytes that produce type IV collagen and therefore they have a role in the development of Alport syndrome. We hope that by seeing the changes that occur in Alport syndrome in more detail we can improve our understanding of this disease. ATHENA Natural History Study on Alport Syndrome is Recruiting Now! Contribute to the advancement of Alport Syndrome research by helping investigators learn more about the progression of our disease. Take action now to be part of this study! The goal is to enroll 100+ patients by June. You must be 16 years of age or older and not have experienced kidney failure. There are other pharmaceutical companies that may have potential therapies for Alport Syndrome in the pipeline and the success of this study will demonstrate that enough patients can be recruited to have a successful trial. Study sites are currently located in 5 countries with 5 sites throughout the US. Travel and lodging assistance, and in-home visits available at select locations. Go to www.alportstudy.com or talk to your doctor now. You may also join the Alport Syndrome Treatments and Outcomes Registry (ASTOR) to be notified of any future clinical studies for Alport Syndrome. A very interesting piece of research brought to us by one of our Edinburgh Meeting attendees Derek Keen. He has just accomplished 30 years on dialysis. UCSF bioengineering professor Shuvo Roy is developing artificial kidney that could revolutionize care for millions of people around the world. The implantable device would provide relief for people with kidney failure who rely on dialysis or are on the waiting list for a life-saving organ transplant. Experiences of Alport Syndrome Research Project – Can you help? Alport UK are currently funding a research project into what it is like to live with Alport Syndrome. This study is about understanding what it is like to live with a rare condition like Alports. It is being undertaken by the Health Experiences Research Group (University of Oxford) and is being headed up by Dr Sara Ryan and Dr Melissa Stepney. They would like to interview you about your experiences, thoughts and feelings of living day to day with Alports. Extracts of your interview would then (with your permission) be put on the website Healthtalk.org (this can be in video, audio or written only format). Taking part in the research means you will help put together a fantastic resource/toolkit on the website Healthtalk.org offering people with Alports practical and emotional support and information. The website is also used by healthcare professionals like doctors and nurses for training.